I must admit when I first planned my layover in Mexico City to write this article, the idea was to focus on things to do and see within only 48 hours. However, after an unforgettable evening at this hotel, I knew I’d have to rethink things. I’m a big fan of the Camino Real chain and had always wanted to stay at the Polanco property, but I had no idea what was in store when we checked in. First, if you’ve never been to this hotel, it’s in a central location to explore the city and every one of the 712 rooms and suites come with all the bells and whistles. The chain’s namesake originated from 16th century Spaniards who called the route that led into the capital of “New Spain” the “camino real.” In modern times, the Camino Real group has 20 properties throughout the country and symbolizes everything that’s “quality” about a stay in a Mexican hotel. 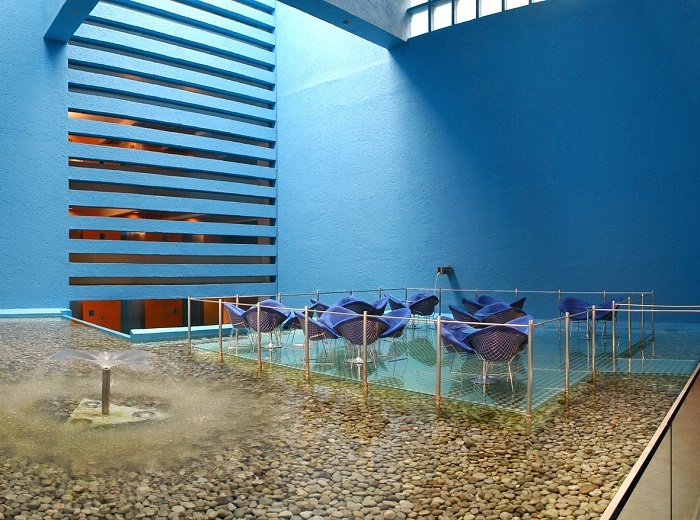 The first Camino Real property was opened in Guadalajara in 1958. The Polanco location, showcasing the unique pyramid-esque architectural design of Ricardo Legorreta, opened in 1968. A number of reviews have called it a “hotel-museum” because of its unusual look and its world-class art collection. 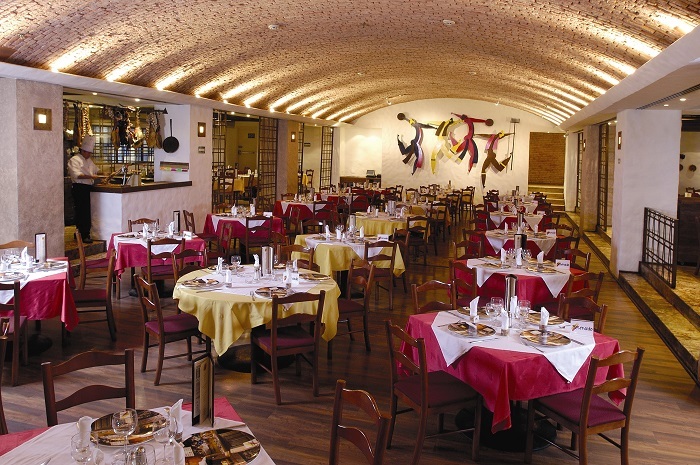 In addition to all of that, the Camino Real also boasts some of the finest dining in all of Mexico City. We started out at the Blue Bar just off the main entrance to the hotel. Our hostess, the wonderful Diana Miller of Grupo Real Turismo, welcomed us with a tasty Pear Bellini (pear nectar, pear brandy and some chilled extra dry champagne) and only a hint of how the evening was to unfold. 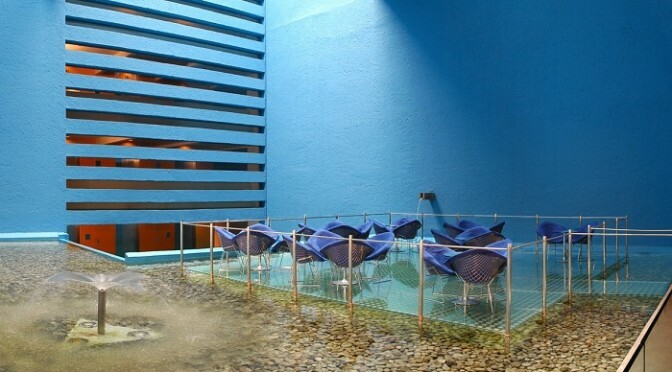 The Blue Bar is slick and modern with a portion of the seating built on a translucent floor over a shimmering blue pool. The ambiance is a mix of modern and eclectic, but it’s a true lounge atmosphere and the drink menu reflects the same, with its variety of signature cocktails and martinis that will tempt even the most discerning sippers. We also sampled some fine tequila before moving on to the food fest that was ready to unfold. It’s surprising that all the restaurants are tucked away from the lobby, so when you’re checking in at the front desk their location isn’t easily discernible. 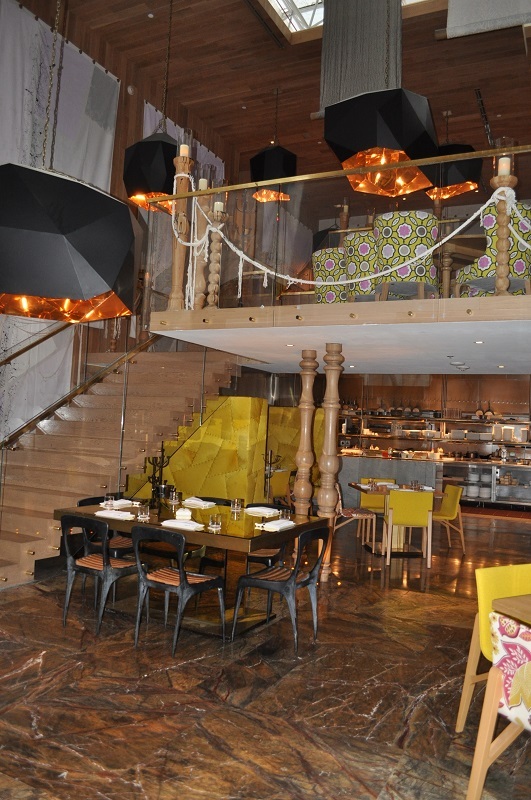 What a treat to have such a gastronomic extravaganza under one roof… and all only a few steps apart. Our first stop was the María Bonita restaurant. The namesake of this seductive looking eatery comes from Mexico’s most iconic actress and movie star, María Félix. María was the quintessential diva and was known worldwide for her beauty and elegance. 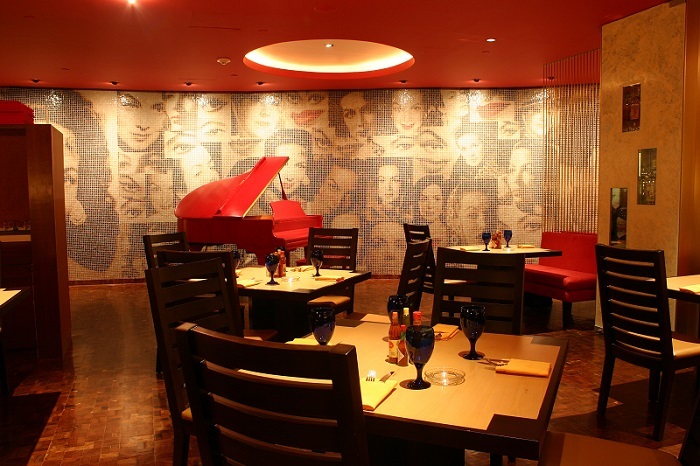 The restaurant is bathed in deep colors and has an intimate feel. We sampled the mini tostaditas de aguachile which is made with raw shrimp cooked in lime juice. (If you’re a shrimp lover it’s a MUST!) The menu is comprised of an unusual blend of traditional Mexican favorites interwoven with some modern and innovative recipes. The fifteen different kinds of tacos along with entrees featuring fresh fish, shrimp, beef and “all you can eat” Pozole (a well known Mexican stew made with pork) will be sure to satisfy your cravings. Next on the tour were the flavors of Spain at the Centro Castellano. The restaurant itself has been in Mexico City since 1949 and has had a location at the hotel since 2001. The simple, yet colorful and inviting décor resembles that of a local “hostería” (inn) that might be found along La Rambla in Barcelona. Our treat was perfectly prepared roasted octopus, ham croquettes and a nice glass of the tasty house wine. The menu here is authentic Spanish fare with hearty seafood paella and fresh huachinango (red snapper) along with plenty of roasted goat, veal, lamb and pork entrée selections. The portions are generous and the atmosphere is bright and lively. Next time I visit, I’ll need to try the sangria! It’s not often that I’m totally awed by a restaurant, but that’s what happened at the Beefbar. Sleek and sassy, it’s easy to see why this place is packed all the time. One look at the menu proves that it would rank amongst the finest steak houses in the world. We started with a quick tour of the open kitchen, which was incredible to say the least. Massive stainless steel ovens were custom designed for the restaurant to cook the beef at extreme temperatures. This method sears the outside of the cut while leaving the inside tender and juicy. A seemingly endless array of carpaccios, tartares, ceviches and tiraditos are prepared to order behind the ice-cold raw bar. (FYI: A tiradito is a raw fish dish similar to ceviche, but in a spicy sauce. It originated in Peru and reflects the influence of Japanese immigrants on Peruvian cooking.) Beefbar’s Executive Chef, Eduardo Morali, graduated from the Culinary Institute of America in New York and brings his sophistication to the menu. In addition to every cut of meat imaginable, including corn-fed aged (22 months) American Black Angus Premium beef and Kobe Style aged (30 months) beef, there is also fresh fish (Róbalo, Chilean Sea Bass and Red Snapper) and exceptional pasta entrees (think Foie Gras Ravioli with a port reduction and Wild Mushroom Risotto). The menu also boasts such originals as Churros with Truffle Oil followed by a Praline and Caramelized Banana Soufflé for dessert. It could take years to try it all! My chef husband said this place makes “Ruth’s Chris look like fast food.” On a side note, check out the bathroom… it might be one of the coolest I’ve ever seen! By this time, we were all overwhelmed with the extraordinary quality of each of the restaurants… it was only getting better. Dipping into the Japanese side of things, we arrived at Morimoto. Multi-level and visually stunning (modern meets traditional Japanese), this restaurant was meticulously designed by world renowned Chef Masaharu Morimoto. Morimoto, who grew to fame on Iron Chef America, spent a year making sure every element of the restaurant was perfect. (We would soon discover the food was equally as impressive.) The main floor is covered in an elegant marble while the remaining levels are done in French oak. The 75-foot glass ceiling is truly unique. Morimoto’s culinary vision began in 1980 when he opened his first restaurant in Hiroshima. His first venture outside of Japan was in Philadelphia in 2001. Morimoto now has locations in Napa Valley, Boca Raton, inside the Taj Hotels in Mumbai and Delhi, Waikiki and in 2014 he will open locations in Chicago and South Beach. Morimoto is notorious for using the most sophisticated kitchen equipment to ensure the fish served is always completely fresh, including two medical-grade “super freezers” that keep fragile and seasonal cuts like toro (tuna belly) at -112 degrees Fahrenheit (- 80ºC) so the fish can be frozen without the cells being damaged. All of that said… the food is brilliant. Chef Pablo Peñalosa Najera runs the open expo kitchen and expertly executes all of Morimoto’s signature dishes. The Buri Bop (yellow tail over rice prepared tableside and served in a stone bowl) is amazing. All the finest fish makes the menu and there’s always something a little unexpected in the ingredients. Where else would foie gras and wasabi share the same plate? My suggestion: try it all! The adventure continued at Bice Bistro. Bice is global chain with humble roots. Started in Milan, Italy in 1926, by Beatrice “Bice” Ruggeri, the restaurant boasts the same traditional Italian favorites that have been in her kitchen for decades. The goal of the Bice brand is to maintain the neighborhood feel of a “trattoria” while always remaining true to the inspired recipes of its master chef. After running a successful restaurant in New York for many years, Bice began to expand and now has locations worldwide, all with same style and menu basics. 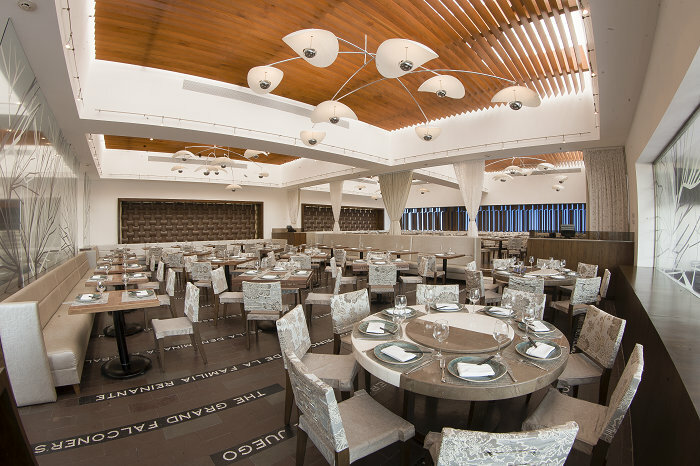 The décor at the Camino Real location is modern, inviting and minimally decorated. Open 24/7, Bice gathers Mexico City’s late night dinner crowd who enjoy the house specialties with a Mediterranean flare, fine Italian standards and pizzas prepared in a wood burning oven. We tried a trio of pastas (Ravioli di Granchio, Fetuccini Alfredo and Spaghettoni Emilia); each was al dente to perfection and the flavors weren’t overpowered by heavy sauce. I have eaten at the Bice Bistro in Scottsdale, Arizona as well and can attest to the consistency of their quality from location to location. With stomachs almost full and taste buds overwhelmed, we finally made it to our last stop. 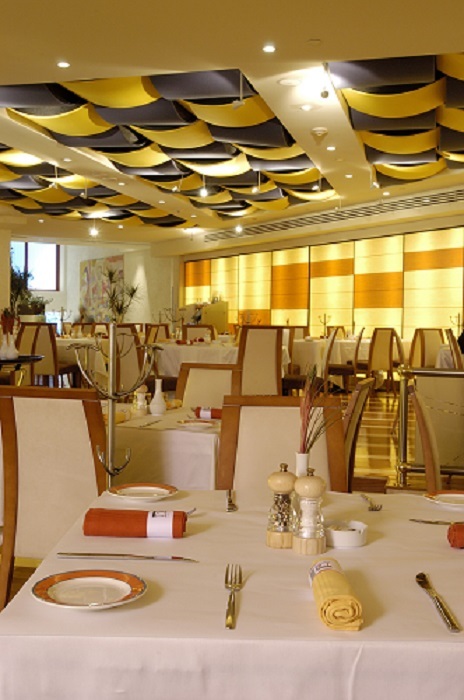 The China Grill is a busy, seen-to-be-seen kind of restaurant. 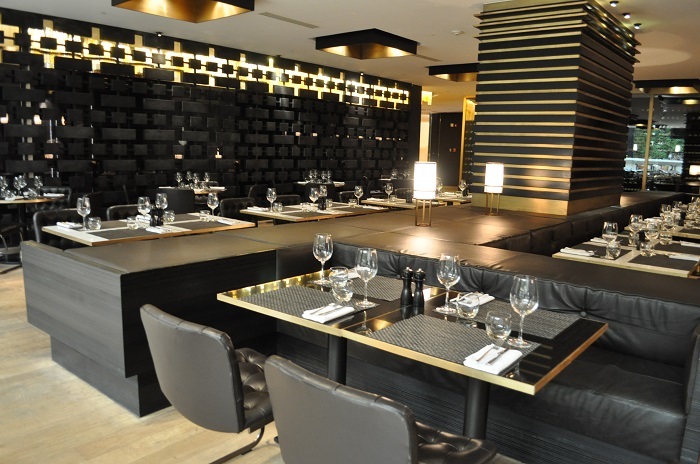 Full of beautiful people to highlight the beautiful, sleek décor, it’s no surprise the menu is top notch as well. The original China Grill opened in New York in 1987 and was an immediate hit. More than 25 years later the legend lives on in both New York and Mexico City. The name can be a bit deceptive because even though there are plenty of Asian dishes on the menu, it fancies itself a restaurant with “global cuisine.” You’ll find a hint of Italian, Japanese, French, American and Chinese blended into a very special menu. Inventive selections range from Tempura Tuna Sashimi in hot mustard champagne sauce and Merguez Lamb Sausage Pot Stickers with curry and lemon oil drizzle to Black Tea Smoked Sea Bass with grapefruit and Thai basil salad, Papaya Marinated Rib-eye and an Australian Rack of Lamb in a Lotus Leaf. Since this was the end of our extravaganza, we were greeted with a fantastic dessert. Our Bananas in a Box (caramelized bananas atop caramel rum ice cream) was decadent, delightful and the perfect end to a perfect evening. Our “destination dining” experience was extraordinary and will be another in a long list of unforgettable evenings in Mexico. My foodie friends and chef husband had been rendered speechless… and that’s a tall order! It’s no secret you eat well in Mexico City and I can promise you won’t be disappointed if you add any of the restaurants at the Camino Real to your list. ¡Buen provecho!